In April 2009, I decided to go vegan whole-hog (no-hog ha ha). I wasn’t happy about it. I work a lot. I’m the mother of 3. Life has many demands. I love meat (especially lamb) and cheese. In fact at one point I was an aspiring cheese maker. But I had a bunch of minor health issues that the traditional medical establishment wouldn’t (couldn’t?) deal with so I went the alternative route. I started seeing a holistic medical practitioner named Jeanette and she encouraged me to go vegan. I dabbled on the edges for months – actually, almost years – until she said “Ruth, you’re not getting the hint. You need to go vegan.” So I did. It was hard but I bought about 10 cook books, devoted myself to research and experimentation, and promised myself to keep an open mind. Andrew (my awesome, handsome, totally supportive husband) said “It’s just food. Cook it. Eat it. See what happens.” So that was my approach. And now I love it. We both love it. It has solved not only my initial minor health issues but so many more. It’s been quite a journey. And others have followed it asking me for advice, recipes, ideas, and support. 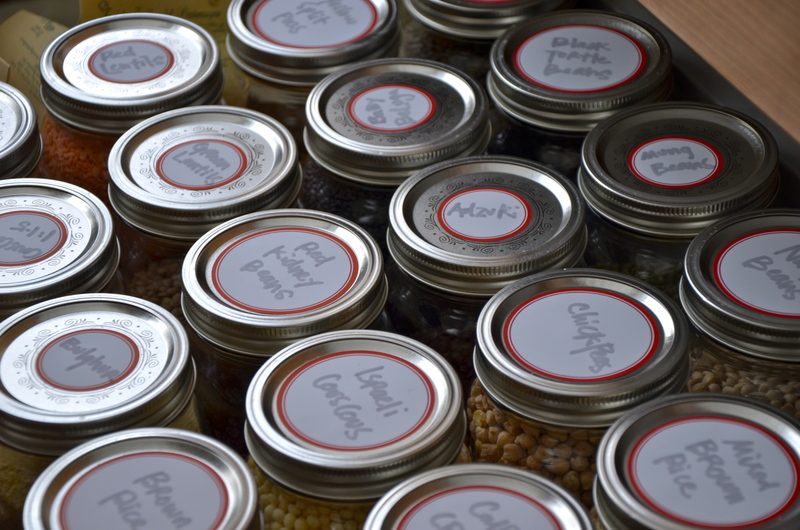 After a few emails I decided to just stick it all on a blog. So here’s v:gourmet. I hope you like it and find some inspiration here – or at the very least, some good, tasty recipes. Oh and I’m getting some upgrades done to the site which will make it new and improved for you! 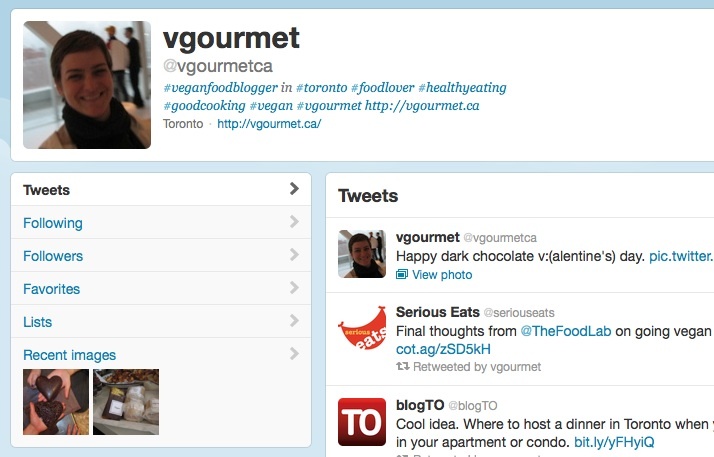 One of those upgrades is direct links to v:gourmet twitter and facebook. You’d think I’d have figure that out awhile ago but I’ve been too busy cooking delicious food and shooting awesome v:gourmet videos. So, until I get my mise en place where technology is concerned, here are the links to twitter and FB. Check it out – they are just another couple of ways to share the love and follow what’s happening with all things food, all things vegan, all things delicious in the kitchen. Thanks Nina-Marie! It’s been an exciting journey as you know and I’m glad the blog has inspired you. Try the vegan cesar salad dressing when you need a reminder of lazy summer nights filled with good friends and good wine. Thank you for your support, interest, and cheerleading. As always! Onwards indeed. I found your site just two days ago, with a little help from my daughter Rebecca. I recently became Vegan one year ago, for health issues as well. I was seeing a traditional Chinese Acupuncturist, and he said, “I cure yo Lupus guaranteed, but first you must change your diet. I was surprised how easy it was. I always loved eating vegetarian food, but never thought I would ever be giving up my yogurt and cheese! So, I have made your breakfast quinoa with the lemon zest and poppy seeds, soooo yummy!! I had for lunch and snack also. I can’t wait to try all the other recipes. Hi Ruth! I stumbled upon your blog through our LinkedIn connection – congratulations! Once again pursuing your passions and helping others along the way. I tried the veggie pate – tastes exactly like one I used to buy! I even tried – and loved – the kale chips. In fact I’ve eaten more kale this past week than the last 6 months combined. Thanks for the inspiration! So nice to hear from you! I hope you are well. And I’m so pleased that you found v:gourmet. The veggie pate is one of my favourites … and I’ve caused addictions the world around so beware. And the kale chips are such a happy reminder of Wabun Point. Seeing your reference to them brings back happy memories. I actually haven’t cooked them in awhile so you’ve inspired me to crank up the oven. I hope our paths cross at some point soon.